Example stimuli from Shakeshift and Plomin, 2015. A new twin study, published today in PNAS, of the genetic influences on face recognition ability, supports the idea that face recognition is a special skill that's evolved quite separately from other aspects of human cognition. In short, face recognition seems to be influenced by genes that are mostly different from the genes that influence general intelligence and other forms of visual expertise. The background to this is that, for some time, psychologists studying the genetics of mental abilities have noticed a clear pattern: people's abilities in one domain, such as reading, typically correlate with their abilities in other domains, such as numeracy. This seems to be because a person's domain-specific abilities are strongly associated with their overall general intelligence and the same genes that underlie this basic mental fitness are also exerting an influence on various specific skills. Nicholas Shakeshaft and Robert Plomin were interested to see if this same pattern would apply to people's face recognition abilities. Would they too correlate with general intelligence and share the same or similar genetic influences? The researchers recruited 2,149 participants, including 375 pairs of identical twins who share the same genes, and 549 non-identical twins, who share roughly half the same genes, just like typical siblings (overall the sample was 58 per cent female with an average age of 19.5 years). The participants completed a test of their face processing skills, including memorising unfamiliar faces, and also tests of their ability to memorise cars, and their general intelligence, in terms of their vocabulary size and their ability to solve abstract problems. Comparing the similarities in performance on these different tests between identical and non-identical twin pairs allowed the researchers to estimate how much the different skills on test were influenced by the same or different genes. All the abilities – face recognition, car recognition and general mental ability – showed evidence of strong heritability (being influenced by genetic inheritance), with 61 per cent, 56 per cent, and 48 per cent of performance variability in the current sample being explained by genes, respectively. Crucially, performance on face recognition was only moderately correlated with car recognition ability (r = .29 where 1 would be a perfect correlation) and modestly correlated with general mental ability (r = .15), and only 10 per cent of the genetic influence on face recognition ability was the same as the genetic influence on general mental ability (and likewise, only 10 per cent of the genetic influence on face memory was shared with the genes affecting memory for cars). Essentially, this means that most of the genetic influences on face recognition ability are distinct from the genetic influences on general mental ability or on car recognition ability. Shakeshaft and Plomin said this "striking finding" supports the notion that there is something special about human facial recognition ability. 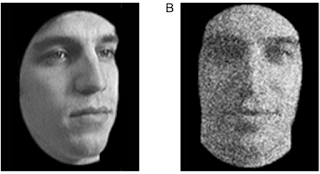 These results add to others that have suggested face recognition is a special mental ability – for instance, some have argued that faces alone trigger brain activity in the so-called "fusiform face area" (although this claim has been challenged); and unlike our ability to recognise other objects or patterns, our ability to recognise faces is particularly impaired when faces are inverted, consistent with the idea that we use a distinctive "holistic" processing style for faces. The story is complicated somewhat by the researchers' unexpected finding that recognition ability for cars was also linked with distinct genetic influences that mostly did not overlap with the genetic influences on general mental ability. Perhaps, the researchers surmised, the tests of general mental ability used here (a vocab test and the well-used Raven's Progressive Matrices) did not adequately tap the full range of what we might consider general mental abilities. Whatever the reason, it remains the case that this new research suggests that face recognition ability is influenced by a set of genetic influences that are largely distinct from those implicated in a similar form of visual recognition (for cars) and implicated in vocab ability and abstract reasoning. Based on this, the researchers concluded they'd shown for the first time that "the genetic influences on face recognition are almost entirely unique."